What happens to orphans after they leave the orphanage? The goal of Agape Ministries is to influence their future by teaching them to live successful life from a Biblical perspective. Upon leaving their orphanage, the teenage orphans assume responsibility for themselves. The question of continuing their education is a very difficult one, since they must also find a place to live and some way to support themselves. The government is not prepared to help them. These young people lack any sort of professional skills and have a hard time finding work. Unfortunately, there are always people who are ready to take advantage of their inexperience, lack of skills and naivete. Unofficial statistics show that a majority of the young girls who are "freed" from the orphanage end up becoming prostitutes, selling themselves cheap simply in order to live. However, those children who heard the gospel in the orphanage already know that the Lord paid a high price for each one of them. Agape strives to find a place for them to live with Christian families, acquaints them with Christians with whom they can make friends, and directs them to local churches. Over many years of working in the orphanages of Ukraine we have seen hundreds upon hundreds of children grow up and leave their orphanages. Where do these teens go after leaving the orphanage? A very few of them get into colleges and universities; others go to study in trade schools where they prepare for a specific 'blue collar' career. (This is where the majority of them end up.) Do they have the skills to live in the real world? Can they easily adapt to new surroundings? What are they able to do? Can they cook, do laundry, spend money wisely? Are they able to live in society? Can they keep up with the customs and laws of society and the state? How and where do they learn how not to become drug addicts, how to stand up to peer pressure, or how to avoid entanglement in a life of crime? Teenagers may or may not ask themselves these kinds of questions but these are the questions we think about as we serve them. How can we strive to help these children not get into trouble? How can we help resolve these problems? We decided to work with them where they live in their trade school dorms. Some doors have opened for us, but for the most part - they have been closed. Working with teenagers is not very easy. As of right now we are working with 9 trade schools, reaching 350 teenagers with a special program that has been given to us specifically to reach these teens. Now many of these students have begun visiting our local churches, some of them have even given their lives to Christ. We are grateful to the Lord for His great mercy! Agape staff are conducting a special program for these teens through which we are providing intensive education in communication skills, good manners, finance management, etc... We pay special attention to those orphan graduates who are seeking God, providing them with a place to live under the supervision of a caring Christian mentor. How can we protect orphanage graduates who have accepted Jesus from the world that they've been separated from for years? How can we help them grow in God? How can we teach them life skills? To address these questions, through studying the experience of many orphanage graduates and those who have worked with them, we came to the following conclusion. We need to set up Adaptation Centers for them, a place which can become a welcoming and cozy home for them, where they can feel like a member of a family. That is just what we have done. 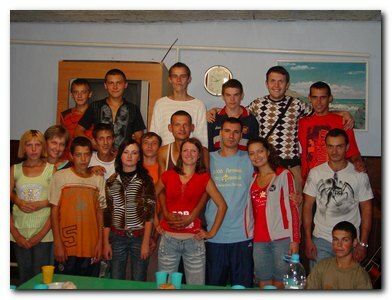 At present there are 9 adaptation centers for orphanage graduates, with 37 teenagers living in them. Almost all of these teens have now accepted Christ as their Savior, they attend and take part in the ministry of local churches, and 22 of them have been baptized. Two of the girls have completed a year-long missionary training program and are now serving as missionaries in other countries. Two of the guys also left recently to serve in long-term missions. Praise the Lord! Our Friends club exists so that we can develop closer relationship with teenagers whose school doors are closed to our ministry. For years now our "Friends Club" has held it's weekly meetings in local churches. There are anywhere from 40 - 50 teens who attend weekly. There are multiple Agape staff and volunteers that are involved in putting together this meeting each week. 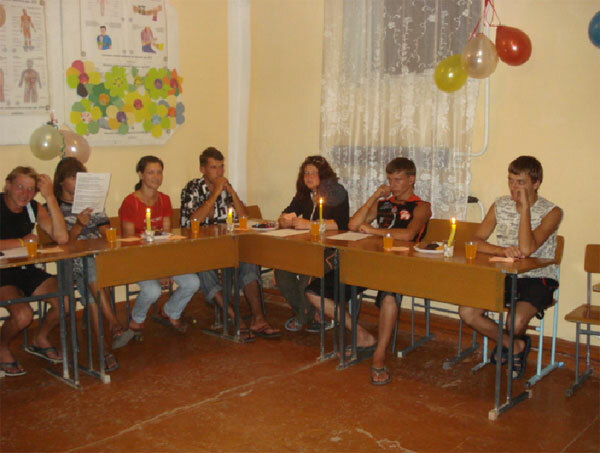 (As of 2014, Agape's "Friends Clubs" are active in the cities of Rovno and Krivoi Rog, as well as in the Sumskoi region of Ukraine.) We praise God for all he is doing through this club and all he will continue to do. Baptism of orphans. Praise God! 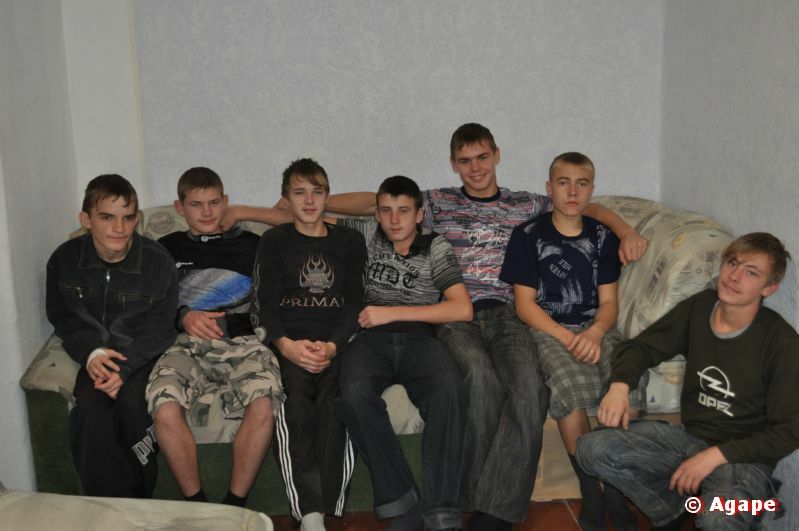 Tsuryupinsky orphanage is the only orphanage in Ukraine where children with hyper difficult forms of disablement live. I graduated from my orphanage and I was clueless about how to survive in the real world. We have a team that performs church services for graduates and provides a Christian fellowship with the children, preaching the Word of God!